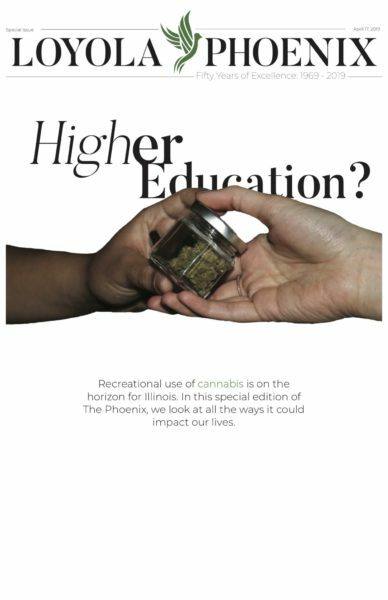 Alanna Demetrius | The Phoenix E-cigarette use among Loyola students has ballooned in line with trends. This year, usage nearly doubled from two years ago. Loyola updated its on-campus smoking policy, which bans smoking inside buildings and within 15 feet of entrances in accordance with Chicago rules, to include vapes and e-cigarettes to catch up to today’s trends. This year, 27.3 percent of Loyola students reported using an e-cigarette in the last 30 days, according to the 2018 National College Health Assessment Survey, That’s almost double the percentage in 2016, when 15.6 percent of Loyola students reporting using the products in the past 30 days, according to the Wellness Center. E-cigarettes or vaporizers are devices that use a flavored liquid and produce a vapor when smoked. They also often contain nicotine, an addictive chemical. 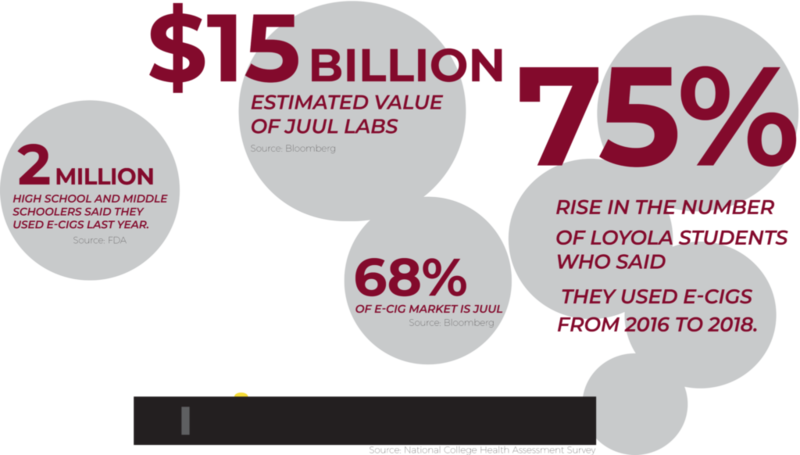 Juuls are the most popular e-cigarette brand and marketed as a smoking alternative to “improve the lives of the world’s 1 billion adult smokers,” the company claims. The sleek black devices resemble USB drives and come in flavors such as mango and creme brulee, making them discrete and wildly popular among high schoolers and minors that may have never been cigarette smokers. PAX Labs introduced the Juul in 2015, but Juul Labs separated into its own company in 2017. Juul takes claim of more than 68 percent of the e-cigarette market, and the company is valued at $15 billion, Bloomberg reported. 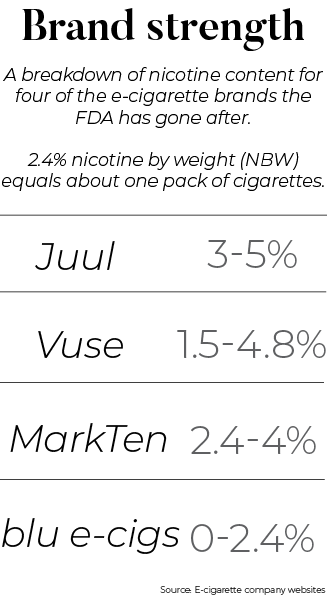 One “pod,” or refill, of a Juul delivers the same amount of nicotine as one pack of cigarettes, the company claims. The FDA said more than 2 million middle and high school students in the U.S. used e-cigarettes or vaporizers, such as Juuls, in 2017. The FDA is giving Juul and the four other top-selling e-cigarette companies 60 days from Sept. 12 to submit a plan to address youth access to their products. If the companies don’t comply, the FDA said they could take the widely popular products off the market. While Loyola and the FDA are taking steps to address e-cigarette use concurrently, they’re fighting different battles. The FDA is trying to keep e-cigarettes and vapes out of the hands of minors, while Loyola wants to stop students from vaping in university buildings. Jeff Gardner, who oversees student discipline at Loyola, said the university’s new policy is meant to clear up confusion among students and assert that e-cigarettes and vapes are in fact included in the campus smoking policy. While reviewing Loyola’s standards over this past summer, Gardner said Loyola looked at universities such as Georgetown, Northwestern and Gonzaga — all of which have similar smoking policies. They also considered Marquette University and Seattle University’s approach to e-cigarettes; both schools banned smoking on campus completely. The FDA’s concern with widespread use among teens comes from the development of young brains and their vulnerability to nicotine addiction. Loyola’s student government has been working to ban smoking on campus completely since 2016, The Phoenix reported, and at that time they did not know how e-cigarettes and vapes would apply. The FDA is specifically cracking down on retailers illegally selling the products to underage users. In Chicago, customers must be at least 21 to purchase e-cigarettes and other tobacco products. 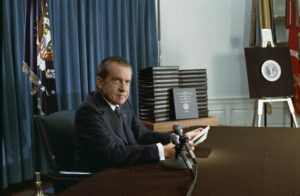 The federal age which some Chicago suburbs and other U.S. states enforce is 18. That’s why Loyola students over 18 can have Juuls and other vapes in their dorms, Gardner said — they just can’t puff them there. Students caught using a Juul or vape in their residence halls or near an entrance could be required to do educational coursework, reflection exercises or community service, according to Loyola’s conduct standards. Elena Cervantes, a first-year studying neuroscience and psychology, said she’s owned a Juul for about two months. She said she thinks the new community standard will be difficult for the university to enforce. However, Cervantes said she believes e-cigarettes such as Juuls and other products should be kept out of the hands of minors. Arabella Bates, a first-year studying elementary education, said she believes it’s still easy for minors to obtain Juuls or their flavored refills, pods. Bates also said she believes Juuls being taken off the market could cause teens to turn to other nicotine products such as cigarettes. “I think you would see an increase in tobacco usage such as cigarettes or other means, I think it would cause quite an upstir,” Bates said. The FDA issued more than 1,300 warning letters and fines to retailers who sold Juuls and other e-cigarettes to minors this summer, according to its statement. In a statement emailed to The Phoenix, a Juul Labs spokesperson said the company is complying with the FDA’s request.